Home FLOYD MAYWEATHER JR Mayweather Vs Pacquiao Fight Results Predictions: A Knockout Win! 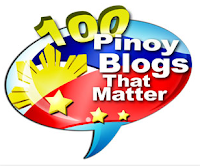 Mayweather Vs Pacquiao Fight Results Predictions: A Knockout Win! 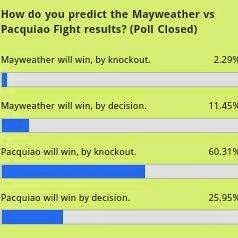 Floyd Mayweather Jr losing to Manny Pacquiao via knockout (KO) - that's how the majority of our readers predict the fight results of the upcoming Mayweather vs Pacquiao Fight. This May 2 (May 3 PH time), the record-breaking boxing fight of the century, Pacquiao vs Mayweather: Battle for Greatness, will happen at the MGM Grand Arena in Las Vegas. And 2 days before the mega match, I have already closed my Pacquiao vs Mayweather Fight Predictions Poll, which was started the moment it was officially confirmed by Floyd Mayweather Jr and Manny Pacquiao in February that the fight is finally happening this May. More than 60% (60.31) of the voters predict Manny Pacquiao will be the winner via knockout, while 25.95% predict the Filipino boxer to emerge as the champion via a decision win. Meanwhile, only a few voters put their confidence on Floyd Mayweather Jr. as the fight winner. He's undefeated, and so 11.45% believe he could win by decision, but only 2.29% predict a KO victory for him. Now I get even more excited. We can watch the Pacquiao vs Mayweather fight for free simultaneously in the 3 major local TV stations GMA, ABS-CBN and TV5 (a first in Philippine TV history) as well as in the cable channel Solar Sports. If you want commercial-free viewing experience, watch it via authorized pay-per-view live streaming in mall cinemas, in other business establishments such as hotels, bars and restaurants, or thru Cignal and Sky Cable subscriptions. If online, the fight can also be viewed via iWanTV or using your ABS-CBN Mobile Sim. Good luck Manny!